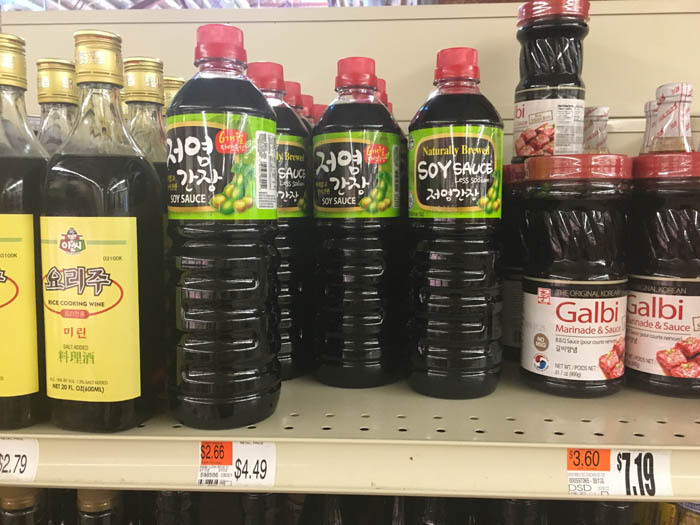 A photograph of Korean food products—rice wine, soy sauce, and galbi (marinated meat) sauce—at a grocery store in Washington, D.C., that I shared with my family and friends in South Korea. "Where did you get that from?" asked the man waiting in line with me at the grocery store as he looked at my jar of kimchi (fermented pickled vegetables). Moments such as these have increased in their frequency for me since I arrived in the United States from South Korea a decade ago. I believe this curiosity stems from the newfound "hip" and "trendy" reputation that Korean food has garnered in many American cities and suburbs in the past few years. An element of the exotic does still remain, although ingredients and dishes such as kimchi, bibimbap, and Korean fried chicken are entering the mainstream consciousness. The exhilaration I once felt seeing Korean food items in non-ethnic supermarket chains and the urge to share pictures of the items with my family and friends back home has subsided into an acknowledgment of their everyday availability. A photograph of Ilhan New. Courtesy of Yuhan Corporation. If, like me, you are a regular shopper in the international aisle of your grocery store, you have seen La Choy soy sauce and canned chop suey. La Choy, the American Chinese food brand, has become a staple of many supermarket chains, but it is worth noting that La Choy's cofounder, Ilhan New, was actually Korean. Born in Pyongyang, the capital city of present-day North Korea, nine-year-old New crossed the Pacific Ocean to study in the United States. 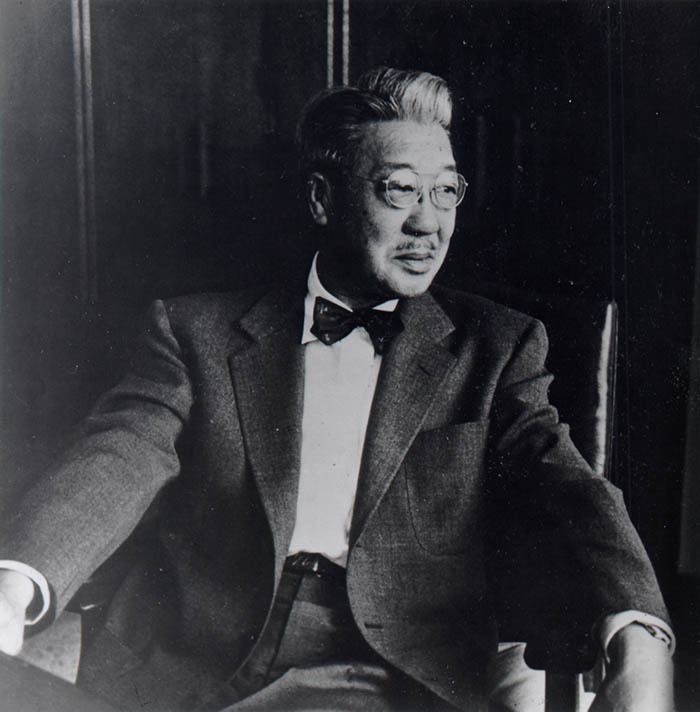 Unlike many other Korean immigrants who resided in Hawaii, New attended a school in Nebraska and pursued his undergraduate education at the University of Michigan. 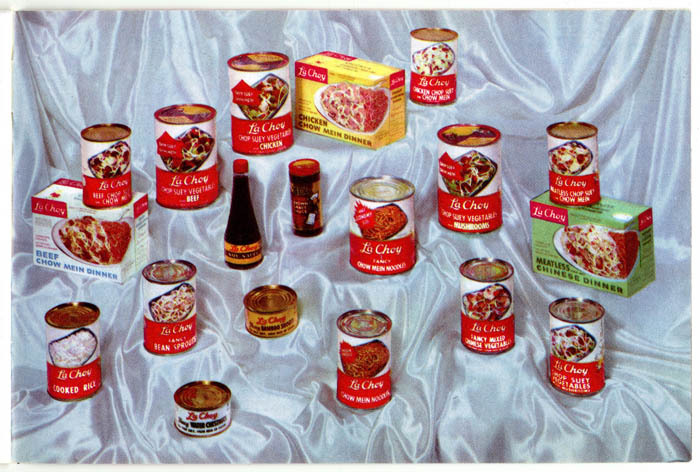 Image of La Choy products from a 1949 La Choy recipe booklet, "The Art and Secrets of Chinese Cookery." Product Cookbooks Collection, Archives Center. The story of La Choy Food Company exemplifies how Korean Americans might have capitalized on the ambiguity of Asian identities in the general American consciousness for marketing their food businesses. Korean immigrants had flexibility in morphing their culinary identity using Orientalism—imagining a stereotypical and "exotic" idea of non-Western cultures, in this case "Asia." Erika Lee's 2015 book, The Making of Asian America: A History suggests that lumping diverse cultures, ethnicities, and religions into one monolithic "Asian" category is one example of Orientalism. 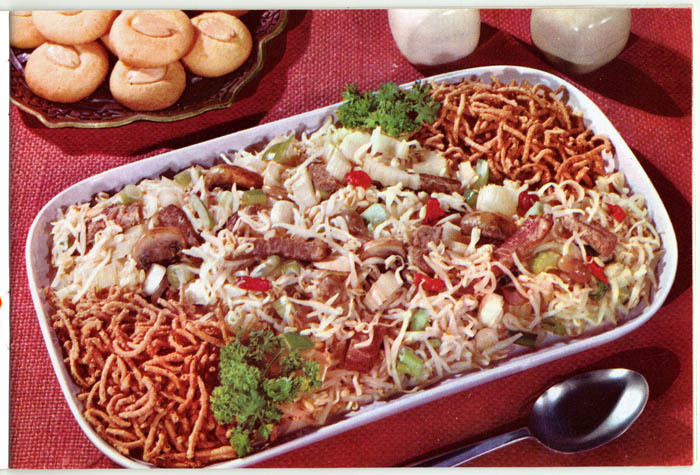 Photo of chop suey from a 1949 La Choy recipe booklet, "The Art and Secrets of Chinese Cookery." Product Cookbooks Collection, Archives Center. Anti-Asian policies including the Immigration Act of 1924 banned new Asian immigrants and prohibited Asian people from becoming naturalized U.S. citizens. Even though Asian people were excluded from American society, "exotic" Chinese-style food became a part of the American palate, in large part owing to the so-called chop suey craze of the 1920s. La Choy's New engaged in this Chinese-style food trend using the fluidity of Asian identities. In order to overcome social challenges arising from his own Asian identity, he partnered with an Anglo-American college classmate, Wallace Smith. Dr. Anne Soon Choi argues in her 2016 article "La Choy Chinese Food Swings American?" that Smith's Anglo-American background enabled New to appeal to the mainstream food market beyond the ethnic enclave, and New's "Asian" appearance also helped to authenticate the company's Chinese food products. The conflation of diverse Asian groups in the American cultural mind enabled New to apply his Korean ethnicity to Chinese culinary identity interchangeably. 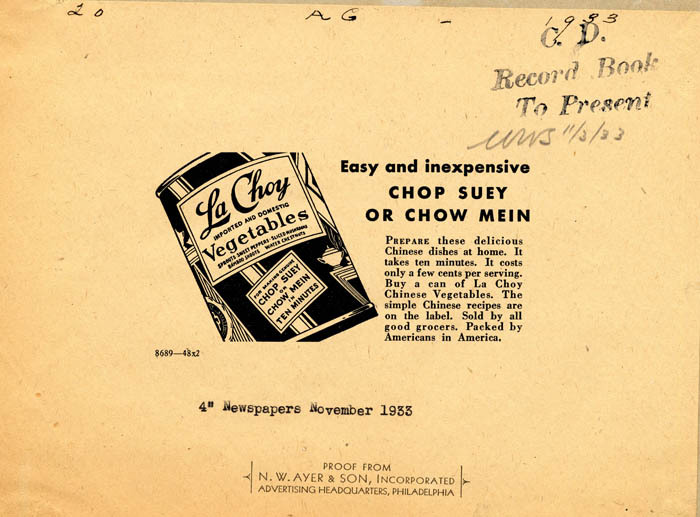 A 1933 advertisement for La Choy canned vegetables. The ad reads: "Prepare these delicious Chinese dishes at home. It takes ten minutes. It costs only a few cents per serving. Buy a can of La Choy Chinese Vegetables. The simple Chinese recipes are on the label. Sold by all good grocers. Packed by Americans in America." N. W. Ayer Advertising Agency Records, Archives Center. New's establishment of La Choy illustrates the complicated processes in which multiple Korean (im)migrants have shaped and reshaped their own culinary and ethnic identities in the mainstream U.S. foodscape. It might not have been an accurate reflection of their own identity, but it was a means of survival in their new home and one that is still an ongoing, ever-evolving process. Today, setting aside one's own identity may not be necessary, as the rising popularity of Korean cuisine enables the proud and distinct embrace of heritage, inspiring both Koreans and non-Koreans to add their own unique voices and tastes to the collective American experience. The La Choy company archives are available for research in the museum's Archives Center. Learn the tasty story of Korean fried chicken from the Smithsonian Center for Folklife and Cultural Heritage. Crystal Rie completed a Smithsonian Institution Graduate Student Fellowship at the National Museum of American History in summer 2017. She recently received her master's degree in Asian Studies with a concentration in History, Society, and Culture at Georgetown University in Washington, D.C.